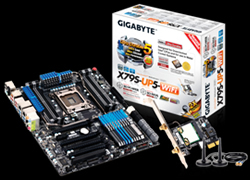 The GIGABYTE X79S-UP5-WIFI motherboard is designed specifically to bring high-end features that you would ordinarily expect to see on professional workstation and industrial server-class systems to a broader and highly discerning DIY PC builder segment. Features such as SAS drive support and ECC memory have been combined with the latest Intel® Xeon™ platform support, guaranteeing the ultimate in performance and reliability. 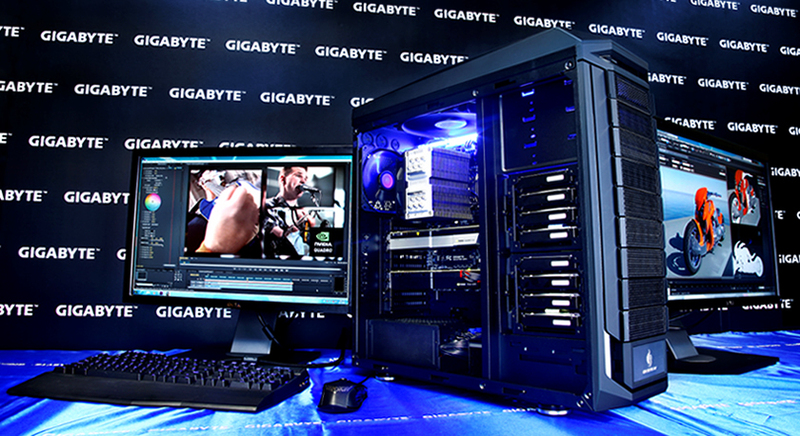 The image above shows an example workstation PC based on the GIGABYTE X79S-UP5-WIFI. Key Specs inc. Intel Xeon E5-2687W, NVIDIA Quadro 5000 plus Tesla C2075, 32GB (4 x 8GB) Kingston ECC DDR3, 8x Seagate SAS 500GB HDD (RAID-0), Kingston HyperX 3K 90GB SSD (OS), Cooler Master TPC Cooler, CM Storm Trooper Chassis plus a GIGABYTE Sumo Platinum 1200W. The above configuration is aimed at creative professionals whose creativity is often dependant on the hardware they are using, especially when working with very high definition media streams on-the-fly. We gave the system to a professional media production company to try for a week or so. Check out the video below and see what they had to say. GIGABYTE X79S series motherboards are developed around the latest LGA 2011 socket with broad support for all Sandy Bridge-E processors including both Intel® Core™ i7 and i7 Extreme processors and Intel® Xeon® E5 processors. With up to eight 64-bit cores and 16 processor threads, substantial integrated L2 and L3 cache, Turbo Boost technology and 4 channel memory, GIGABYTE X79S series motherboard provide access to the most powerful processor architecture available today. GIGABYTE X79S series motherboards are the first mainstream consumer motherboards to use the latest Intel® C606 Chipset. Designed primarily for workstation and server-class systems, the Intel® C606 provides 40 lanes of PCI Express, ECC memory support and comprehensive storage support for up to 16 drives as well as support for the latest SAS (Serial Attached SCSI) drives, as well as support RAID in 0, 1 and 10 configurations. Serial Attached SCSI is the latest iteration of SCSI drive technology, combining the more robust performance and error checking command set of SCSI with modern high-bandwidth SATA connectivity. SAS drives use World Wide Name identifiers to recognize devices and generally have higher MTBF (Mean Time Between Failure) ratings so that users can be sure that their data is secure with superior drive longevity. SAS drives are ideal for systems that are in use 24/7 offering improved stability and reliability overtime compared traditional SATA drives. ECC memory (Error Correcting Code Memory) is fully supported on all GIGABYTE X79S series motherboards. ECC memory uses a special algorithm to encode information in a block of bits that contains sufficient detail to permit the recovery of a single bit error in the protected data, allowing the data to be corrected on-the-fly. This is great for system builders who demand a more stable memory environment, eliminating single-bit errors by detecting and correcting common types of data corruption. GIGABYTE X79S series motherboards are the ideal platform for today’s memory-intensive applications, and take advantage of Intel’s unique Sandy Bridge-E architecture to offer 4 channel DDR3 support, with up to 64GB available* on 4 DIMM slots. * Note: 64GB DDR3 Support is dependent on compatibility. Check the X79S-UP5-WIFI for details. GIGABYTE X79S series motherboards provide support for the latest muiti-GPU configurations, providing PCIe Gen 3 compatibility for the latest HD video rendering and other GPGPU (General Purpose GPU) applications like HD graphical rendering and editing tasks. * Many thanks to Intel, Kingston, Seagate, NVIDIA and Cooler Master for generously contributing key components to the example Workstation PC pictured above. GIGA-BYTE TECHNOLOGY CO., LTD. Any unauthorized use is strictly prohibited.